When I was pregnant with LP I started something that I now doubt I will ever stop doing – batch cooking and freezing. I am lucky enough to have a big American style fridge freezer in the kitchen along with a second freezer in the shed which is perfect when batch cooking for families. I try to keep the freezer in the shed full of a supply of different meats and chicken and the inside freezer is for my batch cooking and things that we need on a daily basis like frozen veg and fish fingers! During my first pregnancy I wouldn’t really ‘batch cook’ – instead I would just make a meal for 4 people, Hubby and I would have half for dinner and the rest I would freeze for another time. I then created a little stockpile of freezer meals ready for when LP arrived. But since having LP and finding myself with free time whilst on maternity leave, I started to dedicate time to cooking and would batch cook freezable recipes when Hubby was at home. It started off as cooking 10-12 portions of chilli or bolognese in one go. This has escalated to how we now live – cooking for one week a month in the slow cooker and cooking at least 8 portions each time. We then freeze the excess and along with what is already in the freezer we have enough food to last us for the majority of the rest of the month. This means we only really do one big food shop and month and then top up with fruit, veg, bread and milk the other weeks. 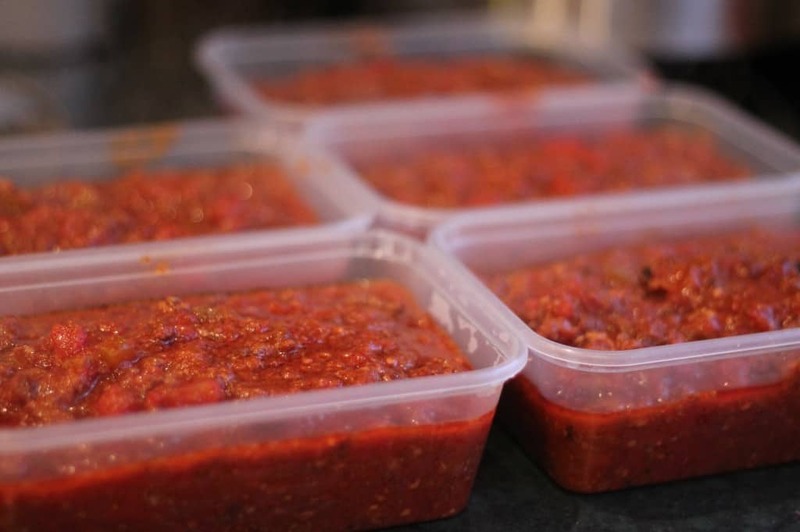 I freeze the bulk meals in freezer bags or plastic pots which I tend to microwave when reheating although you could oven cook them if frozen in metal containers or decant them into a saucepan and reheat on the hob. I’ve also started to use address stickers to write the contents on the pot when freezing meals in bulk so that I can peel them off and reuse them. Anything to save a little bit more money! Healthy batch cooking has now become a habit for me – bulk cooking a huge sausage stew with 24 sausages at a time rather than 8 or cooking bolognese with 2kg of mince each time. In the long run bulking meals saves us a huge amount of time and saves us money too as we’re not buying food we haven’t thought about – there are always reheatable meals in the freezer to eat. The best batch cooking recipes are mostly our favourite slow cooker recipes: bolognese – that can then be bolognese or turned into lasagne or chilli – to have as chilli with rice or with homemade nachos, cottage pie or shepherds pie middle, stews, casseroles, meatballs and sauce or curries. These are all good food to make in bulk and we have so many other batch cooking ideas too. 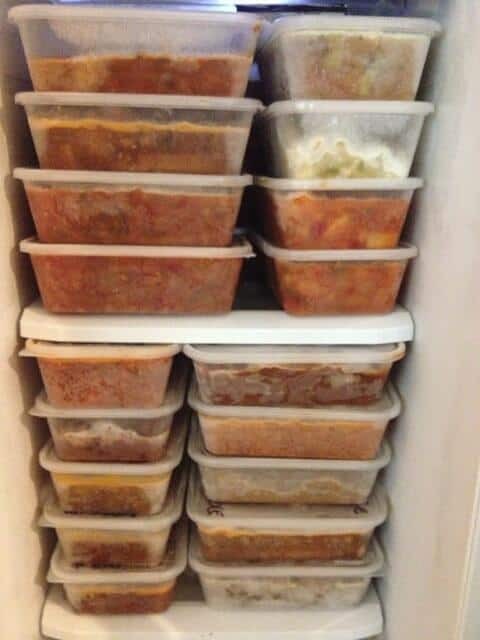 When I’m doing our weekly shopping list and meal plans I include a couple of easy bulk meals for the freezer and a couple of bulk recipes I can batch cook and freeze. I tend to get something out of the freezer the night before we need it and let it defrost. In the evening we then only have to cook potatoes, pasta or rice to accompany it. Batch cooking recipes for freezing has saved me so much time, cut down on meal prep and made our lives so much easier – I’m even looking into getting a bigger freezer for the shed! 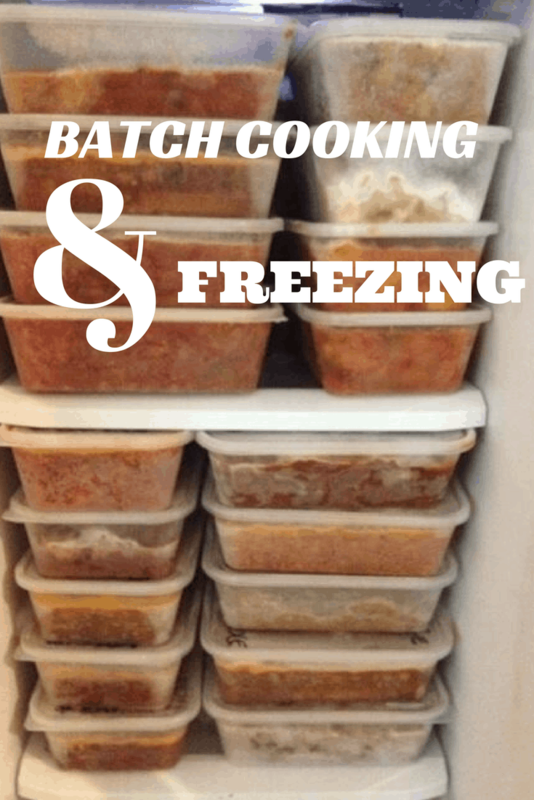 If you’re looking for a quick and easy way of creating family friendly recipes when you’re short on time then I can’t recommend batch cooking and freezing enough. I wish I had a freezer big enough to batch cook! I do always cook extra bolognese though….It’s so handy and goes with so much! And ‘spare time on maternity leave’? How did you manage that! Oh wow! That is some well stocked freezer! We only have a freezer in the house but it’s not that big. We’re planning to rearrange our kitchen a bit (sometime!) and hopefully get a fridge freezer for the kitchen, put the other freezer in the garage and then there’ll be more space for batch cooking though! Your slow cooker must be massive too – I could only fit probably 3 portions in ours at the most!